You must be 19 years old to view this site. Dubz has you covered for all your vaping supplies and accessories. Dubz 420 carries the largest selection of E juice in the Kootenay's. We proudly supply only Canadian approved brands you know and love. Dubz has the largest stash of glass and smoke accessories in the Kootenay's. We have got pipes, water pipes, herbal vapes, concentrate vapes, rolling papers, stash cans, grinders, concentrate accessories, seeds and so much more. Dubz also carries books, blankets, clothing, flags, hats, banners, wall flags, tapestries and many other gift and novelty items. Come check out our vast inventory, you're sure to leave with a piece to make all your friends jealous. Dubz has you covered for all your vaping supplies and accessories. 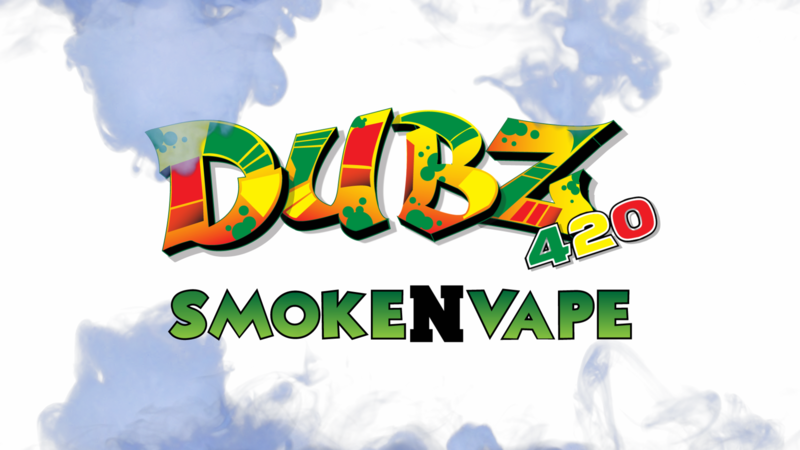 Dubz 420 carries the largest selection of E juice in the Kootenay's. We proudly supply over 90 premium flavors between 12 Canadian approved brands you know and love with new brands and flavours being added to our line up constantly! Dubz will match or beat all local prices. Dubz is consistently bringing in the most sought after and innovative products available to the Canadian market. Everything for the casual E-cig user all the way up to the advanced cloud chaser. We carry batteries, chargers, atomizers, clearomizers, RTA’s, RDA’s, coil heads, mech mods, box mods, tc mods, kanthal wire, titanium wire, nickel wire, organic cotton, drip tips, chuff caps, subohm, ohm readers, coil builder kits and much more. Vaporizers work by heating dry herb material at a cooler temperature than required for burning (combustion). The temperature of vaporization is around 200°C to 392°F. At this temperature, the active ingredients in your herbal material are converted into a gas or vapor. The end result is a smokeless, inhalable vapor that contains the dry herbs active ingredients but not the harmful chemicals usually found in smoke. Some vaporizers rely on plastic balloons to hold the vapor, while others allow users to inhale directly from the unit. Vaporizers are commonly designed for dry herbal material, but some can be used with liquids and concentrates as well. Water pipes work by passing the smoke through water, thus removing various toxins and particulate matter that you might otherwise inhale. Studies suggest that water filtration can be an effective way of reducing exposure to the cancer-causing compounds in smoke. Water also helps to cool the smoke, making it easier to inhale without irritating the airways. Dubz has a vast selection of water pipes across many well-known brands, such as: GEAR, Redeye Glass, Redeye Tek, PURE, BENT, Tech Tubes, Cheech & Chong, Cheech, OG, HOSS, LIT and many more! Redeye glass, Cheech & Chong, Chameleon Glass, Crush, Grav Labs and more! Dubz is also a proud supporter of many local glass artists throughout the Kootenay's and beyond so be sure to check out all the custom pieces! Dubz is your one stop shop for ALL things smoking, our inventory of smoking accessories is massive! Keeping up to date with new industry trends and all the latest gadgets available means we will always have everything you could possibly need to make your smoking experience an awesome one! Looking for a great gift idea? We've got you covered with blankets, flags, hats, shirts, books, games, seeds, stash cans, novelties and so much more! Dubz carries the largest selection of smoke & vape accessories in the Kootenay! Pipes, Water Pipes, E-cigs, Herbal Vapes, Concentrate Vapes, Rolling Papers, Stash Cans, Grinders, Concentrates, Accessories, Seeds & much more. Come check out our massive inventory, you’re sure to leave with a piece to make all your friends jealous! Dubz420 burst out onto the scene on July 18th of 2014 in Cranbrook, BC and has been growing ever since with their new Castlegar, BC location having opened in late 2017. With a commitment to quality and excellence, Dubz is proud to be the dedicated smoke and vape hub of the Kootenay region. Our mission is to provide the Kootenay region with high quality products as well as friendly and knowledgeable customer service. Dubz follows these 3 simple steps to assure a winning business model and satisfied customer every time.